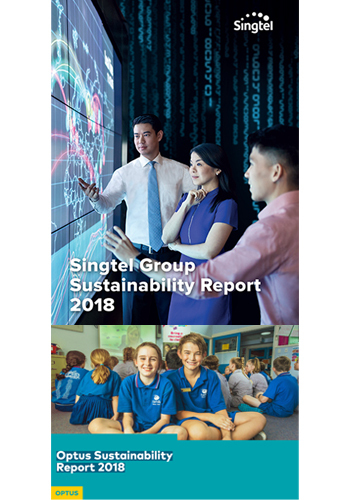 The Singtel Group Sustainability Report 2018 is the company’s fourth Group report which covers the Environmental, Social and Governance (ESG) and sustainability strategies, initiatives and performance of its operations in Singapore and Australia for the financial year ended 31 March 2018 (FY2018). The report provides details of the Group’s commitment towards creating sustainable and long-term growth for its business, while leading and shaping positive change for its four sustainability pillars: Environment, People, Community and Marketplace and customers. The report has been prepared in accordance with the international sustainability reporting GRI Standards: Core option and is independently assured to the International Standard on Assurance Engagements (ISAE) 3000. The report has also been mapped to key UN Sustainable Development Goals. Singtel has been a signatory of the UN Global Compact since 2007 and this report presents the company’s annual Communication on Progress. Included in the World’s Most Ethical Companies 2018 for the eighth consecutive year by Ethisphere. Optus, Singtel Group's wholly-owned subsidiary in Australia, continues to produce a standalone Sustainability Report that gives details on its sustainability programmes in Australia. Optus became a member of Supply Nation, a direct business-to-business purchasing link between corporate Australia, government agencies and Indigenous-owned businesses. Singtel is Asia's leading communications technology group, providing a portfolio of services from next-generation communication, technology services to infotainment to both consumers and businesses. For consumers, Singtel delivers a complete and integrated suite of services, including mobile, broadband and TV. For businesses, Singtel offers a complementary array of workforce mobility solutions, data hosting, cloud, network infrastructure, analytics and cyber-security capabilities. The Group has presence in Asia, Australia and Africa and reaches over 650 million mobile customers in 21 countries. Its infrastructure and technology services for businesses span 21 countries, with more than 428 direct points of presence in 362 cities. We aim to create sustainable and long-term growth for our business, while leading and shaping positive changes for our marketplace and customers, the communities we operate in, our people and the environment. Singtel’s community focus is on the well-being of people, enabling their inclusion into society and helping them realise their potential through our core competence in digital and infocomm technologies. We believe that we can make a difference to disadvantaged communities, especially the vulnerable children and youth, through corporate and workplace giving, staff volunteering and leveraging our skills and ICT innovations. Singtel is a founding member of the Singapore Business Network on DisAbility, which advocates equitable employment opportunities for persons with disabilities through awareness, shared expertise, network and resources.